A traditional style with modern functionality makes the Dresser and Mirror Set a must have piece for your bedroom. 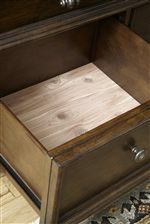 With everyday uses in mind, the ten drawer dresser features cedar lined bottom drawers and a felt bottom in the top drawers. 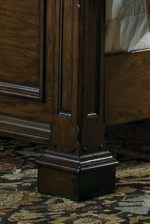 Constructed from select solids and pecan veneers, the dresser and beveled mirror are finished with an aged brandy complementing the grand scaled hardware. The Durango Ridge Traditional Dresser & Mirror Set by Pulaski Furniture at AHFA in the area. Product availability may vary. Contact us for the most current availability on this product. Create a bedroom that you can call home with the Durango Ridge Bedroom Collection. With a variety of pieces to complete your room, the Durango Ridge Collection brings luxury and function. 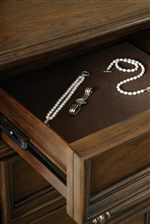 Stunning details in each piece with individually framed drawers, turned bun feet, and grand scaled hardware. The collection is made from pecan veneers and select hardwoods and is finished in an aged brandy creating that warm, rich appeal. Get the most out of your bedroom storage with felt bottom top drawers and cedar lined bottom drawers keeping your personal belongings safe and feeling fresh. The Durango Ridge Bedroom Collection is luxurious and functional for everyday uses. 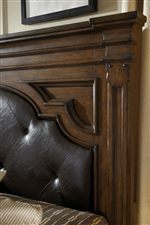 The Durango Ridge collection is a great option if you are looking for Traditional furniture in the area. Browse other items in the Durango Ridge collection from AHFA in the area.